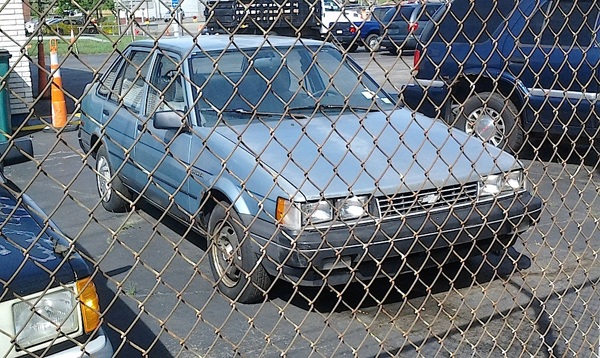 (Welcome to Day 5 of “Don’t Fence Me In” Week…) You say Corolla, I say Nova. Could be a catchy tune, but it pretty much explains the origins of this Chevrolet Nova. These things were built from 1984-88 in Fremont, California in the NUMMI plant. NUMMI was New United Motor Manufacturing, Inc., a joint venture by GM and Toyota which produced a number of Toyota and GM products, including the Nova/Corolla and Pontiac Vibe/Toyota Matrix. It finally closed in 2010, and the plant was purchased by Tesla, who now build electric cars there. Found this fenced-in Nova in Buffalo. Jim Corbran, RRofWNY The post RealRides of WNY appeared first on Buffalo Cars.